This book was later published in the US with a different cover. Maria Benardis invites you to enjoy food the way the Greeks do. The preparation and serving of food in Greece is a ritual, and one that simply must be shared with friends and family. Food is always blessed before a meal, just as they did in Ancient Greek times. 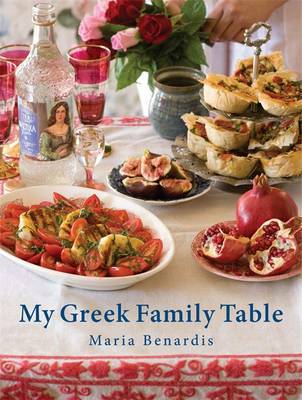 In this collection of recipes handed down through the generations in Maria's family, she offers the best way to make traditional moussaka and lamb souvlakia, through to her own Greek-inspired modern creations. Binding this collection together is the glue of Maria's family. Reminiscences from her childhood spent on the island of Psara transport readers to the rugged hilltops where the family would pick wild greens for use in their cooking. The struggles of Maria's grandmother to feed her young family during the war years offer ways to make use of the few ingredients she had available: dried figs, walnuts, oranges and cauliflower. And Maria's aunt Stavroula, who never writes a recipe down but memorises the detail of each one and demands that others do too, at last allows Maria to pass on, in print, her recipe for delicious avgolemono soup.